Every once in a while I'm foolish enough to pick up a band that I don't know anything about just to see what it's like. Sometimes this leads to a delightful experience, and other times, it leads to listening to an album like Deadstar Assembly's Blame it on the Devil, which is the opposite of delightful. It is, however, a lot like hanging out in a Hot Topic store for exactly thirty-nine minutes. Blame It on the Devil has a slight resemblance to some of the 90s Marilyn Manson or Nine Inch Nails albums, such as the marching title track, but it actually has very little of the same pedigree; its ancestor is the techno album, and the result is what one would expect to hear from a metal album made by techno musicians. The guitars (such as they are -- it's mostly keyboard FX from the sound of it) are synthetic, layered walls of noise, interspersed with sampled vocals, lots of stock techno dance build-up sounds, and drums that speed up manically to encourage dancing -- at least on Filth. The other genre that Blame It on the Devil owes its particular flavor to is melodic punk of the Green Day/Blink 182 school. Dearborn, the vocalist, has that thin-sounding voice late 90s pop-punk was well-known for and punctuates that with hushed yells that are apparently supposed to be something that the kids are supposed to shout along with during live shows, and sometimes this has some glimmers of interest; Amulet is a bit more melodic, and so is Will Not Die, when they're not trying to be anthems for disaffected suburban youth. Many of the songs are completely irredeemable; Baptized by Fire is especially hideous, consisting almost completely of generically angry, shouting vocals with a three-note chorus, and Dirtier Than Sin might easily be considered album filler by even the least-discerning mallgoer. 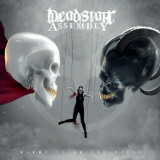 What's amusing is that the band's website (I've been there while writing this review, which was another unpleasant experience) states that Deadstar Assembly is an alternative to packaged, commoditized music. I hope the person who had the bold-faced audacity to claim such a thing was smiling when he wrote those words. Blame It on the Devil, billed as anything even close to a metal album, is the equivalent of a meal made solely out of Play-Doh: A phony mess that slightly resembles the real thing, it is loathsome and unsatisfying, but occasionally (until they grow wiser) consumed by children.